Byron H. asks: What causes dandruff? Ah, dandruff! That white flaky stuff we see on the shoulders of homeless people everywhere. We’ve all seen that guy in front of us at the supermarket who looks like he just came out of a snow storm. Ever wonder what causes this embarrassing blemish on our hygiene? Dandruff is simply dead skin cells that shed from our heads, some can be dry, some oily. 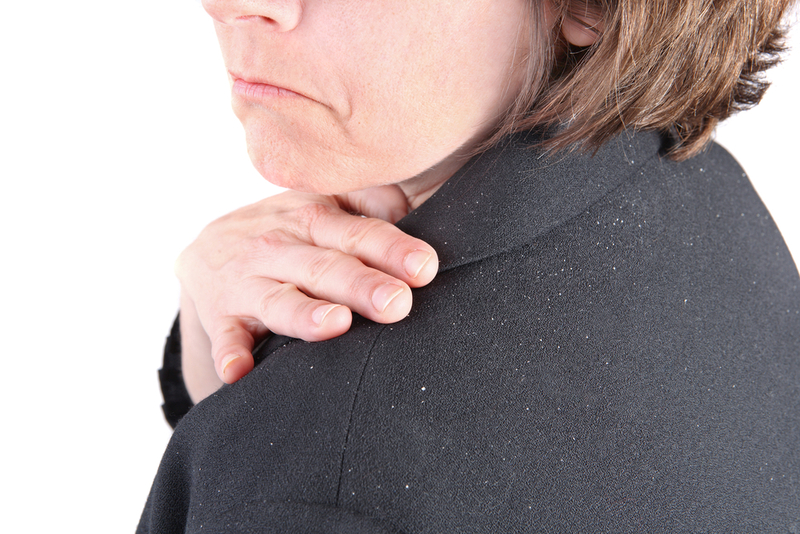 Depending on the medical professional, some will only describe simple dry skin as dandruff. Others will describe dandruff as the result of other conditions and thus refuse to call it dandruff proper- conditions such as Psoriasis and Eczema are examples. These skin conditions can cause an over production of skin cells that slough off and result in dandruff. Some doctors, however, are reluctant to call this sloughage true dandruff, instead, choosing to say it’s a complication of the skin disorder. However you choose to classify your dry skin, the result is the same- flaky stuff that others around us find a little gross. So I will touch on several of the most common types of dry skin causing afflictions. The most common cause of dandruff is simply dry skin. You can commonly get this in the winter when the air is cold and the rooms we’re in overheated. You might have other signs of dry skin on your legs and arms. If you don’t get a chance to shower regularly, this will cause a buildup of those flakes. Those around you will begin to notice, and might take a step or two back from you. The second most common cause of dandruff is known as seborrheic dermatitis. You’ve probably heard it described as “cradle cap” when infants have it. It’s thought to be caused by either an over production of oil on our skin, irritation from a fungal yeast Malassezia, or a combination of both. The result is flaky white-yellowish scales that form around the oily areas of your body, like the scalp, ears, chest, back and sometimes your armpits. It will often times be associated with some redness and irritation. In 2007, an international team of scientists led a study by Procter and Gamble that cracked the genetic code of Malassezia Globosa, the fungal yeast responsible for this type of dandruff. What they found was the fungus doesn’t produce its own fatty acids, which are essential for life. Instead, it produces enzymes, called lipases, that break down the oily products (sebum) produced by our sweat glands (Sebaceous glands). These lipases break down the sebum into a compound called oleic acid. This acid penetrates the top layers of our skin and triggers skin cells to be created faster than normal. The result is dandruff. Psoriasis is another common cause of skin flakes and is a chronic disease of the immune system. The exact cause isn’t yet known, but it’s thought to be an immune system problem where skin cell production is mistakenly sped up. This increase in the growth cycle, causes itchy thick patches of flaky lesions to form. The flaky bits can fall off in the form of dandruff. There are many other conditions that mimic dandruff. They include Rosacea, contact dermatitis, ringworm, acne, Lupus and other autoimmune disorders, photo dermatitis, Perioral dermatitis, and allergic dermatitis to name a few. Common things that can worsen your dandruff include: increase in oil production, sweating, oily skin or scalp, poor hygiene, infrequent shampooing, weather conditions, chronic illness, and a poor immune system. Before I talk about some common treatments, let me first say that getting rid of dandruff completely isn’t possible. As our skin cells die, there will always be small amounts of flaking. According to the Indian Journal of Dermatology, approximately 487,000 skin cells per square centimeter will be sloughed off under normal shampooing conditions. As the amount of skin cells that slough off increases to around 800,000 per square centimeter, the chances of you noticing them increases. Treatment for dandruff varies with the cause. If dry skin results in mild dandruff, simply showering regularly with shampoo and moisturizing conditioner will help. If your cradle cap-like dandruff is caused by that pesky fungus Malassezia Globosa, then the treatment revolves around antifungal shampoos like Selsun Salon and Head and Shoulders. These both contain Zinc pyrithione which is an antibacterial and antifungal agent. You can also use Tar-based shampoos like Neutrogena T/Gel which help slow how quickly our skin cells die and consequently flake off. Other types of anti-fungal shampoos include Selsun Blue, which contains Selenium sulfide, and Nizoral, which contains Ketoconazole. Don’t think these shampoos can only be used on your head. If you have signs of seborrheic dermatitis on other areas of your body, the shampoo will help there as well. If your dandruff is caused by Psoriasis or other skin conditions, the treatment tends to revolve around interrupting the cycle that causes increased production of skin cells, and then removing the scales that are there. Anti-inflammatory drugs like topical corticosteroids are commonly used. Synthetic forms of vitamin D help slow down the growth of skin cells, and medications containing Anthralin (Dritho-Scalp) and Vitamin A derivatives, like Tazorac and Avage, can help normalize the abnormal DNA activity in skin cells. Salicylic acid, Coal tar, and moisturizers help control the excess skin cells that might be present. In the end, simple dandruff is not contagious and does not normally require any prescription strength medication. It’s simply an itchy, embarrassing byproduct of natural skin sloughing. So shower regularly, and for goodness sake, use shampoo! Scientists have estimated that our bodies contain approximately 1.6 trillion skin cells that make up about 16% of our body weight. This, of course, is an average and will vary depending on the size of a person. They estimate that 30,000-40,000 skin cells fall off every hour or close to 1 million every day! Over the course of a year, you will shed about 8 pounds of this dust producing grossness. Yes that’s right, most of the dust in our houses is made up of dead skin cells. Don’t worry though, all these cells don’t go to waste. They help feed the other most common element in household dust, dust mites! Now, go dust your furniture and books! When applying antidandruff shampoo, you should lather up at least twice, then let it sit for about 5 minutes, so that it has enough time to penetrate your skin cells. If anti-dandruff shampoo causes too much of a smell, rinsing with lemon juice is a quick and easy way to remove the buildup and smell. Using tar as a method to control dandruff can be traced back over 200 years. It works by decreasing cell turnover rates. Don’t jump on the tar-based shampoo bandwagon too quickly though. They tend to have very strong odors, and can stain your hair a lighter color. It can takes weeks of normal shampoo use before the discoloration will go away. For someone that learned so much about how dandruff is caused and knows that sometimes it is out of the patient’s control, you’re really insensitive. Keep mentioning how it’s embarrassing, please. Like readers of this won’t already know that. Really? If someone is reading this, they probably already do that. Learn how to keep your nasty opinions to yourself, and focus on writing a valuable article with actionable information only.